I am a self-proclaimed ATR fanatic, yet I have not explored Keltner Channels. 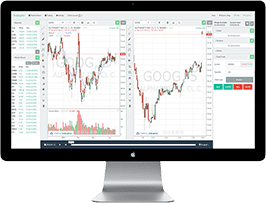 The Keltner Channel is a lagging on-chart indicator that uses a combination of exponential moving averages and the Average True Range (ATR) as inputs. 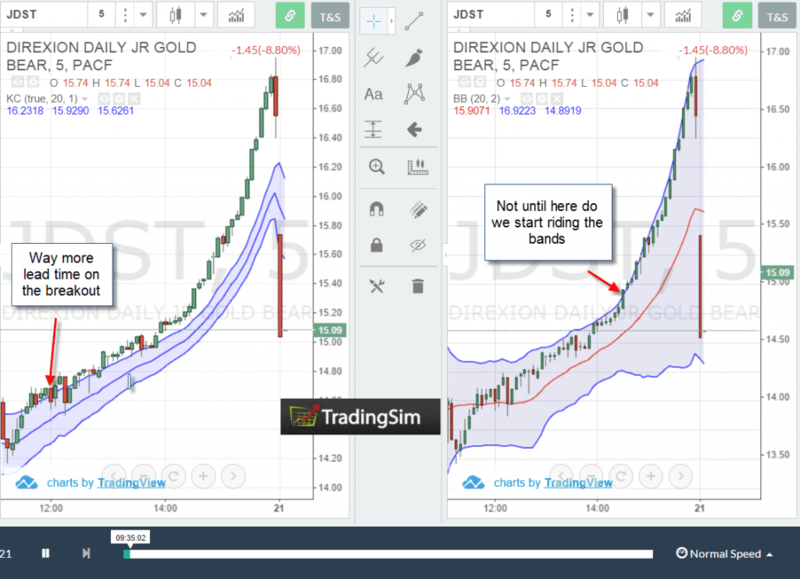 Unlike Bollinger Bands, which uses standard deviations to calculate the width of the channel, Keltner Channels uses the exponential moving average and a multiplier on the ATR to determine the upper and lower bands. I'm not as scientific as my other trader brethren are, so I'm not going to get into the details of the Keltner Channel formula, but rather will show you the inputs of the Keltner Channel. The Keltner Channel indicator uses two inputs to configure the indicator. The first is the length of the exponential moving average and the second is the multiplier you would like to factor in with the ATR. A good rule of thumb is the longer the length of the exponential moving average, the greater the lag on the indicator. Lastly, the higher the multiplier, the greater the width of the Keltner Channel. You should remember to consider these two points when defining your Keltner Channel trading strategy. If you want more of an understanding around the actual formula for the Keltner Channels, please visit this Wikipedia article. Now, I could go on and on about how Linda Raschke tweaked Mr. Chester Keltner's formula and yet the indicator is still called Keltner Channels, but I would rather dive into the charts of comparing the Keltner Bands to Bollinger Bands. 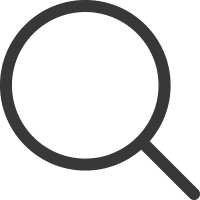 Again, if you are looking for more technical articles on the two indicators, there are tons of posts on the web. I figured I would just stick to the comparison and leave the number crunching up to the mathematicians. With that said, let's dive into our first working example. 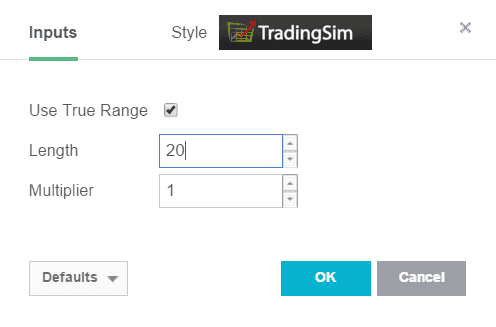 Just to be clear we are using the default settings for both the Keltner Channels and Bollinger Bands found in most trading platforms, which is 20 periods. In the below chart example, we are reviewing a 5-minute chart of Ford with the default Keltner Channel settings of 20, 1 and the default settings for the Bollinger Bands. You will notice on first glance at the chart that the channel is much tighter on the Keltner Channel. In this particular example, it was much clearer to me using the Keltner Channel that Ford was done once it hit its peak. If you zoom in on the example, you can see that there were two green bars and one red bar that were completely outside of the envelopes. Once the second candle closed below the low of the preceding red candlestick and inside of the envelopes, Ford was done. Now, if you look at the exact same chart, but with the Bollinger Bands, the action was neatly inside of the envelopes, so as a trader you have a tougher time identifying when a stock is going to breakdown. 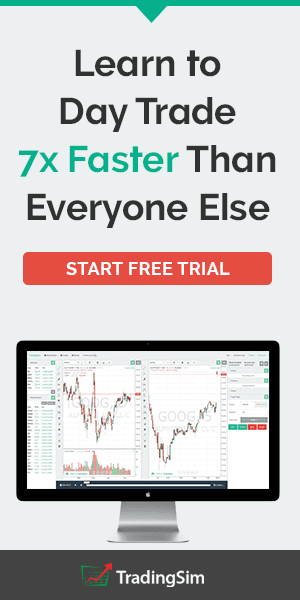 If you are day trading with the Keltner Channel, having the ability to quickly notice when a trend can be changing is huge. For those of you wondering what is the difference between this example and riding the trend, it really comes down to the impulsiveness of the move. As you can see in the above chart, the price action for the most part stayed completely outside of the Keltner Channel. In our first example, the price movement wasn't as extreme. Okay, back to the second example, JDST went on a run that we all would love to partake in on a regular basis. The question comes down to which indicator would have me in sooner and allow me to ride the impulsive move higher? Without a doubt, the Keltner Channels made it very clear when JDST started breaking out. Once the move started, I would have to say that both the Keltner Channels and Bollinger Bands did a great job allowing the trend to develop. Due to the early entry on the run up, I have to give round 2 to the Keltner Channels. Our score now stands at Keltner Channels 2, Bollinger Bands 0. Just a side note, assuming you are day trading, then the major gap down the next day would not apply because you would have closed your position. The late day breakout is the bane of my existence. I spent 20 months chasing these late day bloomers before finally realizing this wasn't my calling. 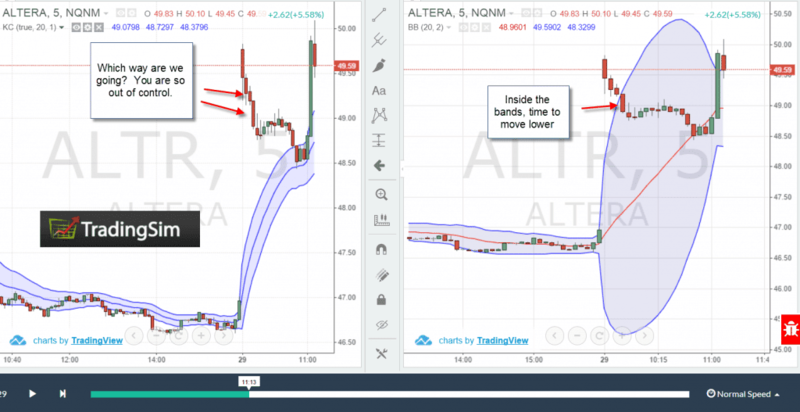 In the below example, we will dig into whether the Keltner Channels or Bollinger Bands can better detect when a stock is beginning to trend late in the day. As you can see, UAL was trending sharply to the downside on the 5-minute chart. There was a swing low put in around 1:30 pm, and then the stock had a slight retracement before testing the daily low again at 2:25 pm. This is where I would lock up, as I would be forced to make a decision. The volume of course would be light as we were in the early afternoon, yet there is a new low. Well, the Keltner Channels provides us a nice head start on the move as the candlestick closes completely outside of the Keltner Channel. Therefore, while the volume and price action may not have been significant, you could clearly tell that the volatility was in play with a close outside of the channel. Now as we look over at the Bollinger Band example, the stock was still nicely sitting inside of the bands, albeit riding the bands. For this example, I have to go with the Keltner Channel, because I will always go with outside of the bands versus riding the bands in terms of strength of trend. Our score now stands at Keltner Channels 3, Bollinger Bands 0. 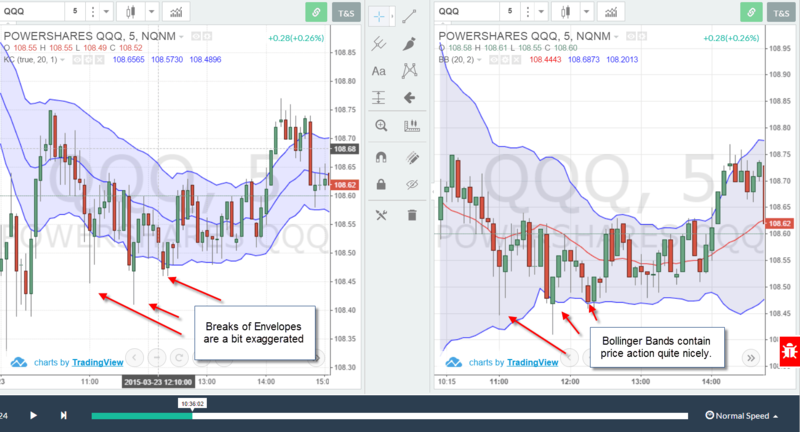 The morning reversal is another powerful day trading pattern, as stocks will experience sharp snap back moves. ALTR experienced a high volume gap up on May 29th. As I was reviewing the Keltner Channel, I realized the candlesticks were well beyond the upper channel. So, once ALTR started to give it up, how were you to know it's time to short or where to exit your long position? Conversely, as we look at the Bollinger Bands, once the stock comes inside of the bands, you know things are in trouble. Therefore, in the snap back reversal, Bollinger Bands are more suitable as the indicator is based on standard deviations. The crazier the action, the wider the Bollinger Bands will expand, which will clearly display the breakdown if the stock starts to give it up. Our score now stands at Keltner Channels 3, Bollinger Bands 1. Choppy markets are a reality of trading whether we like it or not. So, when it comes down to properly containing the price action, which indicator does a better job of filtering out the noise? As you can see, the Keltner Channel is more sensitive to the price movements in tight channels, therefore buy and sell signals could be a bit exaggerated. However, as the Bollinger Bands are calculated using standard deviations, the bands do a much better job of filtering out the noise within a range bound market. Therefore, for choppy markets, the nod has to go to Bollinger Bands. Our final score comes in with Keltner Channels 3, Bollinger Bands 2. Each of these price-lagging indicators do a great job for what they are designed to do. As volatility is baked into the Keltner Channels, the indicator does an awesome job of providing insight into stocks when they are riding the trend, strongly trending higher or breaking out. Whereas the standard deviation component of Bollinger Bands gives enough of a range between the upper and lower bands to better handle significant gaps that reverse sharply and range bound markets. At this point, I'm assuming you are wondering which indicator is better and in the true form of a trader, I will say both. As stated throughout this article, trying to say one indicator is better than another is relative. It truly comes down to the 5 scenarios you are attempting to trade and your trading goals. 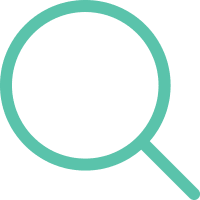 To see how Tradingsim can help improve your trading performance, please visit our homepage to see our latest offerings. using the keltners and the bbands together works very good. when the bands dip inside the keltners pintpoins the set up, then the trigger..